I’ve never given vegetarianism or veganism serious consideration. Nor seriously engaged with an adherent of either about their motivations. It seemed commonplace enough to be unremarkable - a respectable preference that wasn’t for me. What little thought I’d given to the idea could be boiled down to the argument from the natural order - many animals are carnivores, so why should we restrict ourselves? While exploring the effective altruism movement last year, I came across the first chapter of Singer’s Animal Liberation  where he lays out the core of the philosophical argument for minimizing animal suffering and was recently intrigued enough to read the rest of the book and engage fully with the ideas. The core of the argument asks us to acknowledge that, just as there is no difference between the human races when it comes to being human, there is no difference between humans and other animals when it comes to the capacity to suffer. Just as being human entitles one’s interests to equal consideration among all humans, so having the capacity to suffer entitles a being’s interest in not suffering to equal consideration among beings. “Pain felt by an animal should be given the same weight as the same amount of pain felt by a human.” If we acknowledge this, then we cannot morally cause that pain in an animal for the purpose of a mere preference in taste. This argument took some effort to internalize, but I now accept its validity. The text addressed well the various conceivable misunderstandings or objections - for example, equal consideration does not imply equal treatment or rights, plants do not suffer in the same way that we do, modern factory farm conditions indeed inflict considerable pain - as well as my naive rationalization from nature. Unlike the carnivores, humans have the capacity to think morally. With our intelligence comes the responsibility to consider such ethical questions as minimizing suffering. The problem is that achieving this practically is difficult. Even “humanely certified” dairies (separation at birth, bull calves sold to slaughter, continuous pregnancy and milking) or “free-range” egg farms (aggressive laying schedules and feeding, beak trimming, male chicks sold to slaughter) or “painless” slaughterhouses (crowded feedlots, mistakes with the captive bolt gun) are not without significant suffering . The pressures of the market encourage treating the animals as machines, especially when the consumer is uninterested in the details. I find it is important to keep in mind the utilitarian equivalence of even seemingly minor suffering to pain we feel as humans. We can imagine the physically unpleasant moments of being farmed for flesh and wonder if we would inflict that on ourselves for the pleasure of eating the animal product. Flesh and animal products truly free from inflicted pain might be ten to twenty times more costly to raise than factory farmed flesh. Very small herds, caring husbandry, uneconomical resource utilization, careful killing. An expensive delicacy. At what point is the taste worth the effort? Veganism is the obviously unambiguous moral choice, but I do not think I have the willpower for that just yet. Because pain-free products aren’t readily available for sale, I must rely on some kind of metric to help me make choices to reduce the suffering I sponsor. Sufficient strides have been made at the vanguard of humane farming of animals that some products are available for which the embodied suffering is tied mostly to processes surrounding slaughter. For example, pasture-raised hens can have fairly pleasant lives until the hours before slaughter where they are crated up, shipped, racked upside down, and conveyored off to stunning. For this reason, animals that produce a lot of product over their lifetime, like dairy cows, rank very high (better) on a calorie per suffering metric . If we assume equal suffering per death and assign equal value to the suffering of different animals, salmon and chicken flesh are roughly equivalent in calorie per suffering, eggs rank ~10x higher (better) than that, beef ranks ~10x higher than eggs, and dairy ranks ~20x higher than beef. Based on this metric, if one must consume animal products, one should should stick with dairy. And if flesh must be occasionally tasted, then beef is least harmful. However, there is another metric I consider important - greenhouse gas emissions. Climate change is an immediate crisis that will cause great suffering to beings and damage to ecosystems on a scale much larger than animal farming (irrecoverable diversity loss, many more beings affected by 2-4 orders of magnitude ). Though harder to quantitatively compare, minimizing its impact by reducing greenhouse gas emissions is just as important as reducing farm suffering, if not much more. 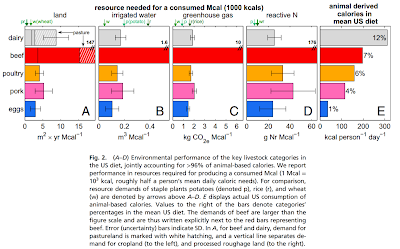 Studies of the relative environmental impacts of animal farming show that beef is ~10x worse than all other animal products . This penalty knocks beef down to rough equivalence with eggs in the ranking above. My diet has changed considerably over the last ten years. From what was approximately the average American proportions, I estimate that my flesh consumption has decreased by 5-10x. Dairy and eggs have probably stayed about the same. Vegetable consumption has increased maybe 2-4x. These changes have been motivated solely by exposure to new foods, increased consideration of my physiological health, and consciousness of the impact that my choices have on greenhouse gas emissions. But now, the acknowledgement of the equivalence of the capacity for suffering among beings demands further change. As I rarely eat chicken or beef already, it is easy for me to eliminate terrestrial flesh entirely. Eggs and fish consumption is next for reduction. Finally, I plan to slowly work on reducing dairy intake. This is possibly my brain forecasting and generating loopholes, but I think it is important to remember that because being perfect often distracts from other valuable things, drastically reducing is often almost as good as entirely eliminating. Trying out this new perspective feels disconcerting - a disturbance in the norms I’ve been comfortable with. I catch glimpses of what people might have felt when deciding to treat slaves as humans. It helps me appreciate the struggle this idea continues to have in gaining credence in our culture. The core of the idea also seems to be hidden behind so many contrasting and confusing prescriptions, that the effort to examine it and form a considered opinion is a deterrent. It seems especially important to lay out clear cases and engage in debate. I’d love to hear and discuss other perspectives and rationales. Eshel et. al. 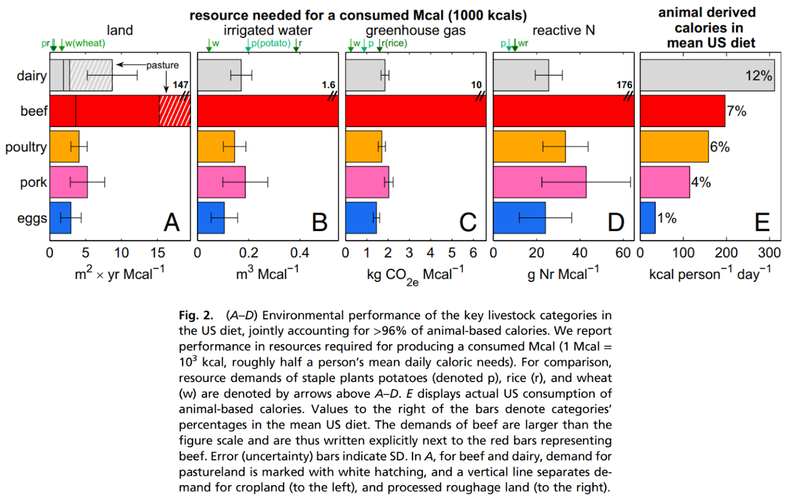 Land, irrigation water, greenhouse gas, and reactive nitrogen burdens of meat, eggs, and dairy production in the United States. 2014. Just discovered, or re-discovered your blog. I understand your motivations more and really appreciate your thought process. It was given me food for thought (no pun intended). Thanks for sharing.